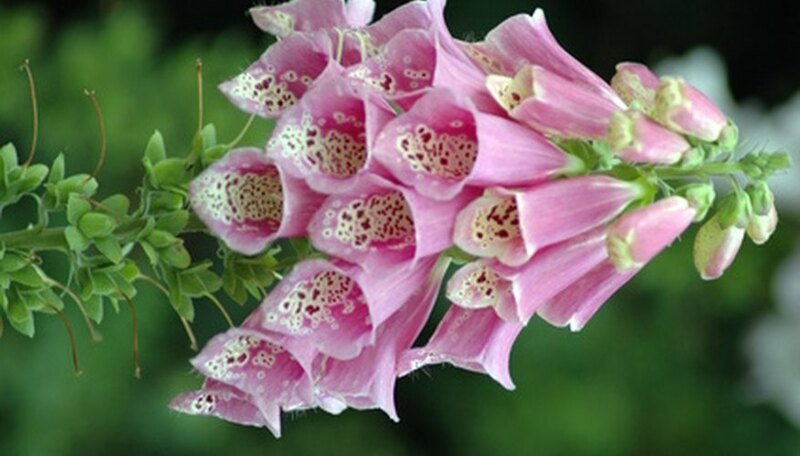 The foxglove is a striking flower with its tall spikes of pretty bells standing tall among the shorter plants. It has a history of medicinal uses and was highly regarded as a remedy for edema. You can find these springing up as weeds in some areas along roadsides where the seed has spread. With a little care, you can transplant them to your garden. Isolate the base of the plant from the other plants or weeds nearby by pushing back the leafy matter. Pull out surrounding weeds to make room for a shovel. Transplant foxglove that has not yet blossomed, as foxglove typically goes to seed and dies off in the second year. Dig straight down in a circle around the base of the plant, taking care not to damage the leaves. Cut your shovel in and under the plant, coming in from several angles and loosening the roots from the soil. Pry up the rootball from the soil. Lift the plant, keeping as much soil as possible around the roots. Place it into your garden where it will get partial shade, good drainage and fertile soil. The foxglove is hearty and will respond quickly to its new surroundings, especially if you move it during spring to early summer when the temperatures are not yet too hot. Water the plant and the soil surrounding its new location with 2 or 3 gallons of water immediately after planting. Keep a close eye on the plant for the first week to make sure the soil does not dry out. You should see sign of new growth within 10 to 12 days. All parts of the foxglove are toxic and should not be ingested. Wear gloves when handling foxgloves to prevent dermatitis.